As many of you know, we are off to Las Vegas next month. Last time we were there I don't quite remember that we had rented a car, so we took some cabs and did some walking, took in a tour as well to the Hoover Dam, and had stopped over at Lake Mead to have a view from the road above. On this trip back, we will be taking a cruise on the lake with Lake Mead Cruises. We've decided on their mid day sightseeing cruise aboard Desert Princess that lasts for 90 minutes, as we have such a full schedule planned of sightseeing while in the area. The Desert Princess is an authentic, three-level, Mississippi-style paddlewheeler. Just being on board takes you back to the Old South I'm told.The Desert Princess is U.S. Coast Guard certified for 275 passengers and 10 crew members. She is spaciously equipped with 2 climate-controlled enclosed decks and an open promenade deck just perfect for taking in the cool, clean air and the wondrous sights. 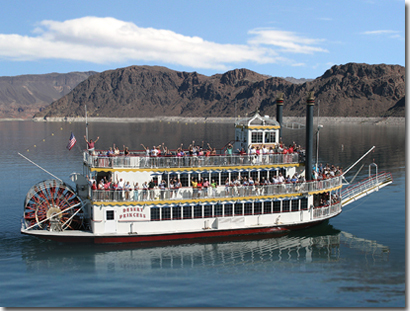 Daytime on Lake Mead gives passengers a chance to enjoy the full beauty the area. These cruises are $25.00 per adult, and $13.00 per child. These cruises run every day of the week, departing at 12 p.m. and 2 p.m.Brunch and dinner cruises are also available. We can't wait to cruise Lake Mead, and tell you all about it.